Wait, hold up. You’re telling me you’re dressed to the nines in your brand new Reformation romper and Goorin Bros.. hat but you’re taking selfies in your fluorescent-lit bathroom? Take a moment to rethink your life choices and then get yourself outside. You are in LA after all—land of picture-perfect weather and inspiring backdrops. Ready to get out there with that friend of yours who still has the same profile picture from The Stone Age 2013 and have the makeshift fashion photo shoot of your dreams? Yeah! But which photography backdrops and where, you ask? 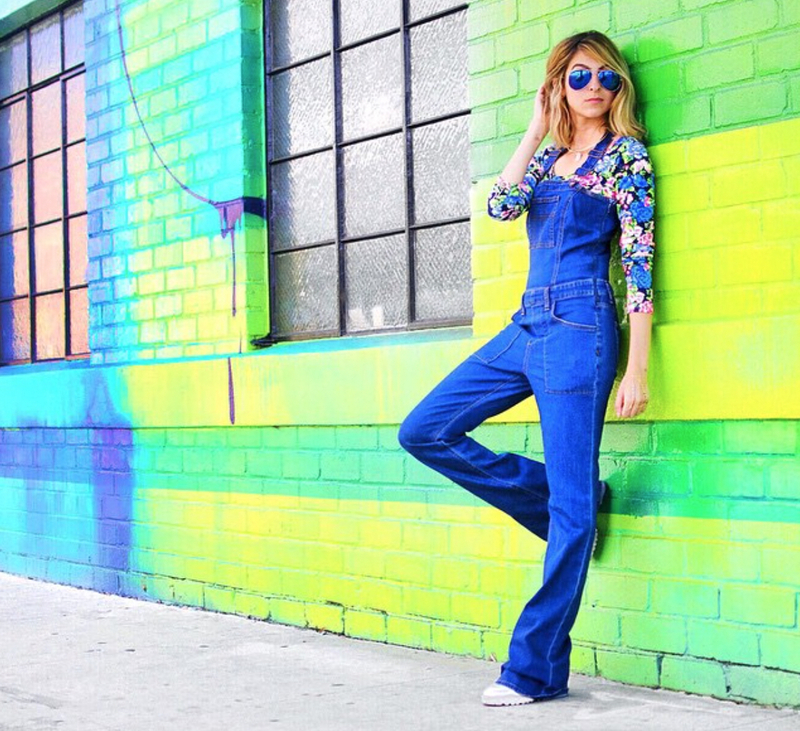 We tapped the cool and colorful Elaine AKA Lainey to find out. She’s known for photos with eye-popping backgrounds that are just as essential as the outfits she rocks. An LA native, Lainey has always been fascinated by pop culture, entertainment and fashion as made evident by her well-known blog, Fashionlaine.com, which features much jealousy-inducing wall scenery. “Los Angeles is such a great place because we are blessed with an array of fun architecture, displays, and graffiti walls that make any photo go from zero to 100 real quick,” Lainey told us while musing on her favorite places to shoot when in need of a good backdrop. Elaine Daneshrad: Who doesn’t love to transform themselves into an angel? There’s always a line of people waiting to capture their perfect angelic poses here. What I love about this wall at St. Regis Wine and Liquor is that it’s in the midst of all the bars and restaurants on 3rd Street. Artist Colette Miller has also painted wings in Mexico, Kenya and Australia. ED: When I saw this rainbowed-out building at the corner of Cloverfield and Broadway, my heart instantly burst at its seams and I immediately pulled over to take some photos. This wall is great because it has such a spectrum of color so you can pick and choose which you’d like in each photo. You can't taste this rainbow, but you can pose with it. Find this fun one at the intersection of Cloverfield and Broadway. ED: The Urban Light installation at LACMA is always a go-to when you’re looking for something with more depth than a wall to pose in front of. I’ve forsure done my fair share of photo shoots at Urban Light, but how can you not when the lights make every photo look so majestic? Urban Light is one of LA's most sought-after photo backdrops since its installation in 2008. ED: Everyone always asks me where I find all the bright and colorful walls I shoot in front of, and of course, a list would not be complete without the most well-known pink wall of them all: the Paul Smith store. I like to call this wall “the mecca of colored walls in LA” because any blogger (or person who loves and appreciates a nicely colored wall) has or will definitely stop by and pay homage to this wall at one point or another. Pose in pink in preparation for shopping on Melrose. ED: This mural, Peace Elephant, by famed Shepard Fairey as a part of the “Art in the Streets” exhibition is one of my all time favorites. 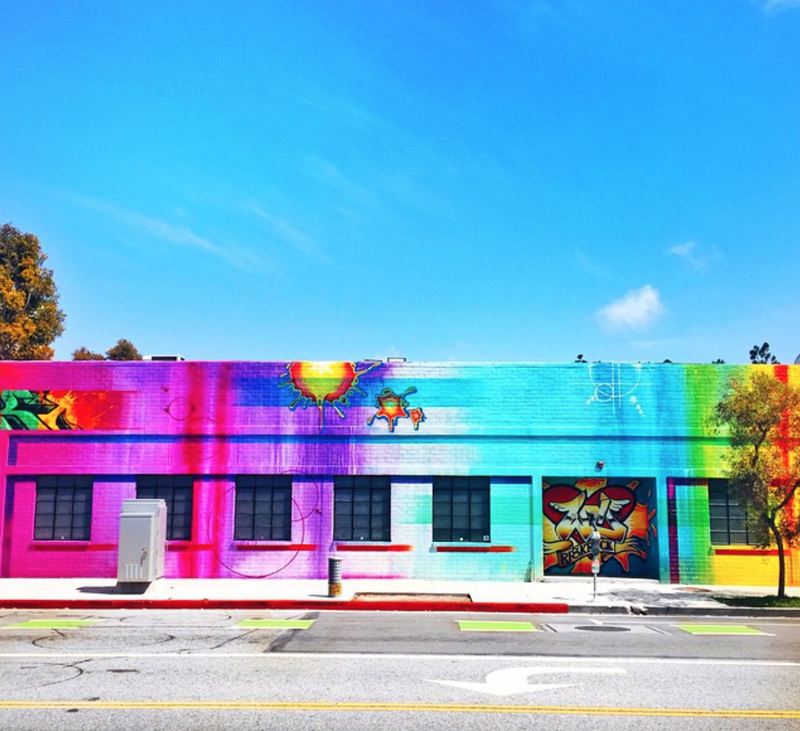 If you’re driving down Melrose, it’s hard to miss the big yellow, black and red elephant on the wall. What’s so great and cool about this place is that it’s on the side of the West Hollywood Public LIbrary parking lot which is totally unexpected. Peace Elephant in WeHo is the largest mural Shepard Fairey has ever painted. ED: The best is when your favorite restaurant doubles as a killer photoshoot op, and that’s exactly what you get at The Church Key. Not only is the food amazing (the Ahi Tuna Tartare and Avocado “Croissant” Toast are both musts! 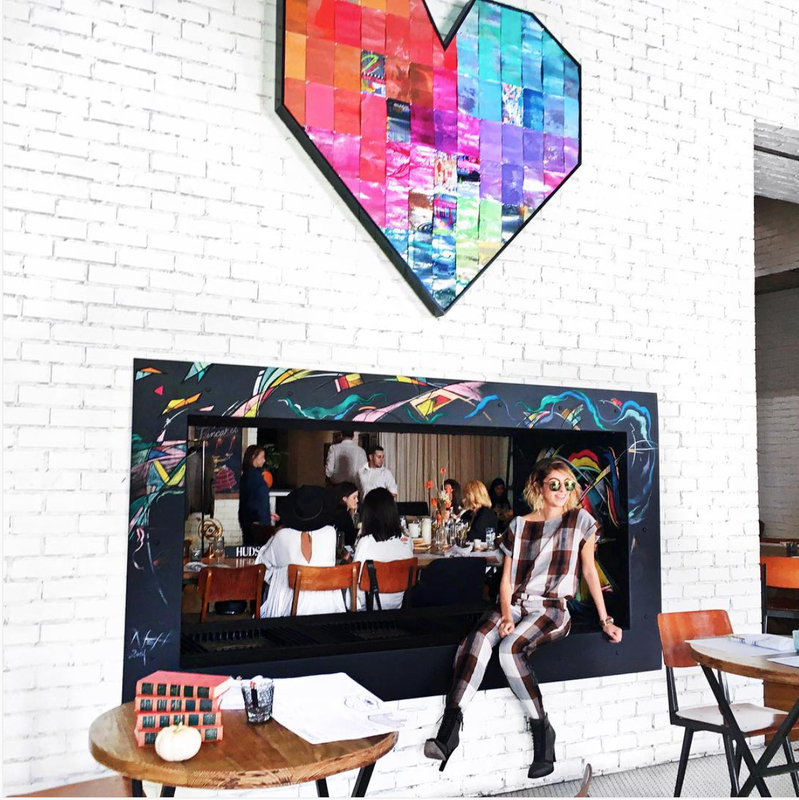 ), but they also have the cutest little rainbow heart on exposed brick above a fireplace that serves as a perfect backdrop for a photo. Come for the Instagram, stay for happy hour. ED: If you’re looking to kill two birds with one stone AKA have a workout with a picture-worthy moment, the Griffith Observatory is the definite go-to. Not only is the majestic view breathtaking, but the planetarium’s architecture is reminiscent of Santorini, Greece. Take a hike in Griffith Park before taking in the views at the Observatory. ED: Hands down one of the most fun places to shoot in LA is at the Santa Monica Pier—and not just because they have a bunch of games and rides. The different booths and rides all pop with color for your perfect LA backdrop! No, you're not too old to ride the roller coaster...ever. 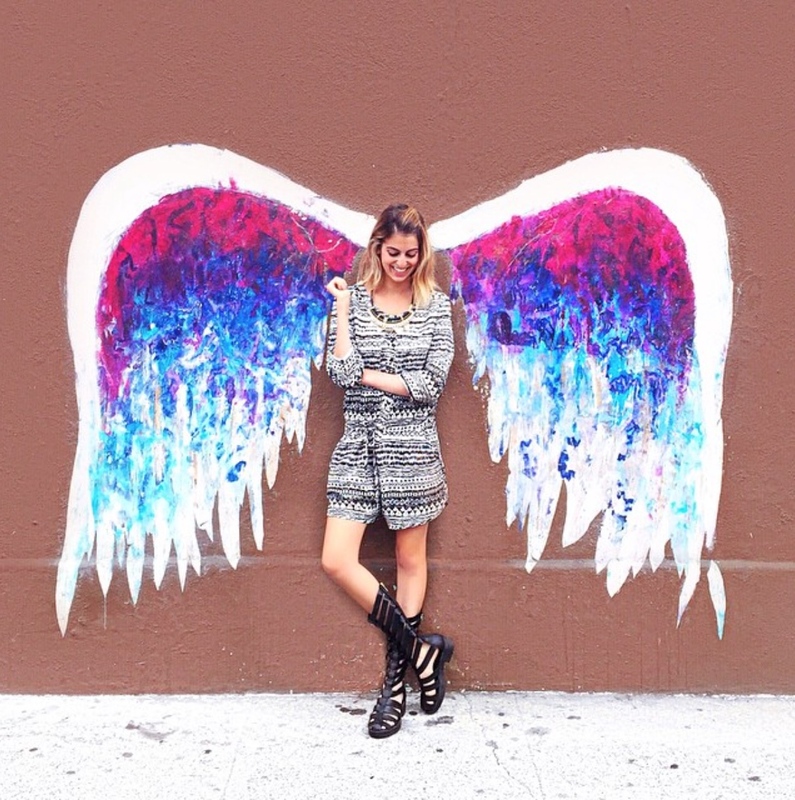 To spy her next fashionista-meets-rocking-backdrop shot, follow Lainey on Instagram/Twitter/Snapshot: @iamfashionlaine. Every moment at The Church Key is an interactive experience. From their menu with dim-sum style service, to canned and frozen cocktails, flaming desserts and even the server attire, they strive to constantly push the restaurant envelope. The Church Key's industrial chic setting is enough for a celebratory evening yet approachable enough to be your neighborhood go-to. Features the well known Rainbow Wall. Stylish boutique selling its own line of contemporary women's clothing made from vintage fabrics. West Hollywood Library features the famous Peace Elephant Wall.